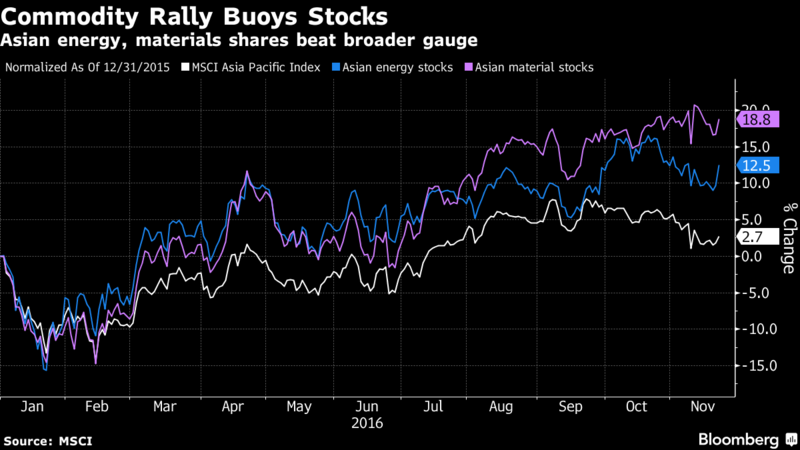 Asian stocks climbed, joining a global rally, and metals advanced, while oil extended its advance on optimism OPEC will agree to cut output. The won strengthened against the dollar. The MSCI Asia Pacific Index of equities climbed 0.9 percent, led by energy and material shares. Copper headed for its highest close since July 2015. Oil surged as Iran signaled optimism that OPEC will agree to a supply-cut deal and Iraq said it will offer new proposals to help bolster unity before next week’s meeting in Vienna. The yen erased an earlier advance sparked by a tsunami warning in the Fukushima region, and South Korea’s currency headed for its biggest gain in two months against the dollar. 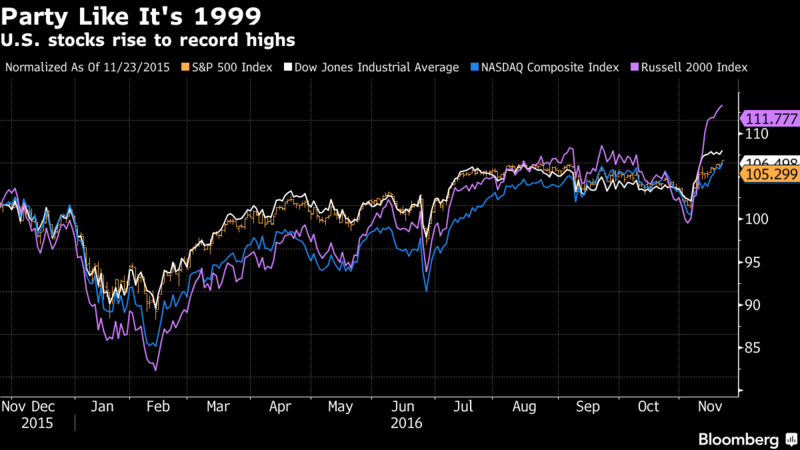 Asian equities gained after all four major U.S. equity benchmarks climbed to record highs for the first time since 1999. American shares were boosted as companies ended a five-quarter profit slump and Donald Trump’s election fueled optimism that his plans to cut taxes and boost fiscal spending will benefit industries more geared toward economic growth. The outlook for world growth is providing a tailwind to risky assets, with Goldman Sachs Group Inc. saying Monday that a renewed acceleration of global factory activity suggests commodity markets are entering a cyclically stronger environment. The MSCI Asia Pacific Index headed for its highest level since Nov. 10. Australia’s S&P/ASX 200 Index rallied 1.2 percent, while Hong Kong’s Hang Seng Index advanced 1.4 percent as of 1:27 p.m. in the city. MSCI’s emerging-market gauge rose 0.7 percent, trimming its monthly slide, as the Kospi index added 0.9 percent in Seoul and Taiwan’s Taiex rose 1.1 percent. 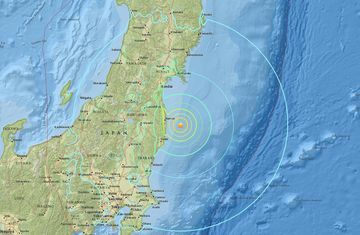 A magnitude 7.3 earthquake struck Japan off the coast of Fukushima. Contracts on the S&P 500 Index increased 0.4 percent. The S&P 500, the Dow Jones Industrial Average, the Nasdaq Composite Index and the Russell 2000 Index rallied to their all-time peaks on Monday. Copper added 1.9 percent to $5,667 a metric ton on the London Metal Exchange, while zinc and lead rallied more than 1 percent. Investors have piled into industrial commodities in the past month amid signs that the outlook for demand is improving. Oil climbed to a three-week high. Discussions went well, Libyan OPEC Governor Mohamed Oun said as he left the group’s Vienna headquarters on Monday evening. The two-day meeting, a warm-up for a full OPEC meeting next week, will continue tomorrow. Goldman Sachs said the likelihood of an agreement meant the bank was bullish on oil in the short term. West Texas Intermediate crude for January delivery rose 1.4 percent to $48.93 a barrel on the New York Mercantile Exchange. Gold advanced 0.3 percent, extending its climb from the lowest since February as the dollar declined, boosting demand for the metal as an alternative asset. The yen advanced as much as 0.5 percent to 110.27 per dollar on Tuesday before erasing the gain. Japan downgraded the largest tsunami warnings issued in the country for five years as the risk to life receded following after a magnitude 7.4 earthquake off the coast of Fukushima. The won rallied 1 percent. The Bloomberg Dollar Spot Index, which tracks the currency against 10 major peers, fell 0.1 percent, after declining on Monday to halt a two-week surge.